Springer Controls/MERZ Enclosed Disconnect Switches Are Made For Motor Control In A Variety Of Industrial Environments. 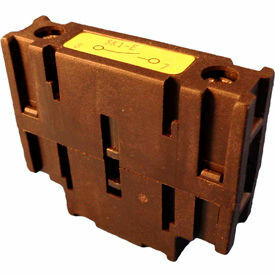 Springer Controls/MERZ Enclosed Disconnect Switches are ideal for conveyor belts, lifts, lathes and more. Maximum voltage is 600V. Springer Controls/MERZ Enclosed Disconnect Switches have an IP rating of 65. Available color combinations are Red/Yellow and Black/Gray. Amps vary per model. Springer Controls Disconnect Switches Are Used For Push Button Operations In Residential And Light Commercial Applications. Springer Controls Disconnect Switches are Disconnect Switches available from 16 amp through 125 amp. Polycarbonate IP 65 rated enclosures. Handle colors in Black/Grey or Red/Yellow with lockable 3 padlock. Available models includeFront Panel Mounting Disconnect Switches - Front-Mount; 4-Hole, Front Panel Mounting Disconnect Switches - Front-Mount; 22mm Hole , Rear Panel Mounting Disconnect Switches, Door Coupling & Interlock, Rear Panel Mounting Including Handle, Rear Panel Mounting, Extension Rod & Coupling, Enclosed Disconnect Switches, Reset Push Buttons and Single Element 22mm Push-Button Stations. Extra poles and auxiliaries sold separately. 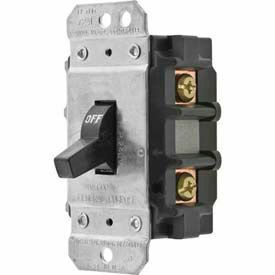 ACI Disconnect Switches Are Used For Dependable Electrical Maintenance And Repair Applications. 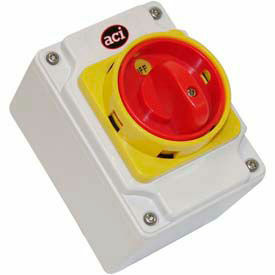 ACI Disconnect Switches are solidly made for long lasting durability and reliability. Easily accessible, finger safe, oversized box lug style terminals with combination screw heads that are furnished open, ready to wire. Compact space saving design. Straight line wiring. Long Life Double Break Contacts (Ag Ni), RoHS Compliant. One piece internal Operating Assembly provides positive contact movement. Operating Shaft is center mounted for easy - balanced operation. Shaft goes completely through switch or inserts 1.14" for maximum rigidity. 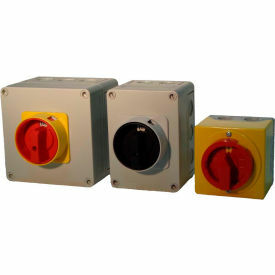 Available with Plastic or Metal Enclosure and 2, 3 or 4 Power Poles. Choose 3-18" to 16" Width 2-7/8" to 8" Depth 4-5/16" to 16"Height. Auxiliary Contact N.O./N.C. : Includes 1 contact for use with push-on terminals, 10A 120/250V AC for 30 and 60 Amp switches. Springer Controls/MERZ Accessories For Disconnect Switches Are Used For A variety Of Commercial Or Industrial Installations And Repairs. Springer Controls/MERZ Accessories for Disconnect Switches are made from high quality materials for long lasting durability. Ground Terminals, Extra Poles, Auxiliary Contacts, Ground Terminal, Neutral Contacts, Neutral Terminals and Terminal Covers are listed for 600V applications. 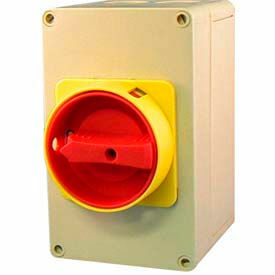 Accessories can be mounted on the left or right of the disconnect switch to meet specific installation requirements. Shaft Extenders and Shaft Extender Support Bracket also listed. UL listed. Compatibility and additional specifications vary by model.